news Communications Minister Malcolm Turnbull has created a promotional video stemming from an official site visit to a NBN rollout zone in the Sydney suburb of Blacktown in what appears to be an attempt to reassure Australians that Labor’s National Broadband Network project is proceeding apace, but without inviting the media to pose questions at the event. In the video, available on Turnbull’s personal YouTube channel but not promoted through Turnbull’s ministerial website, the Liberal MP speaks directly to the camera from the Blacktown NBN site, stating that the Fibre to the Premises infrastructure promised Australians under Labor’s NBN vision is still currently being rolled out. 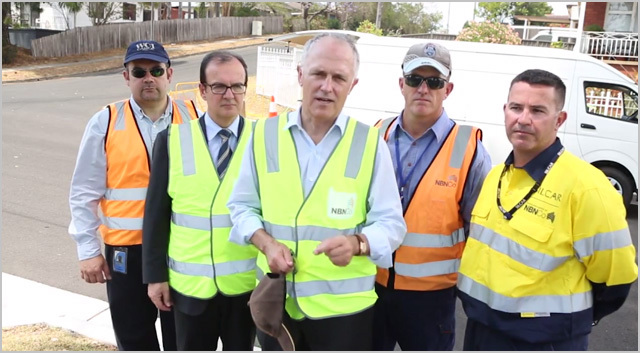 “We’re seeing people preparing pits and splicing and examining the network architecture,” said Turnbull, flanked in the video by staff from NBN Co, including the company’s new Coalition-appointed executive chairman Ziggy Switkowski, as well as contractors from construction firm Silcar, which is deploying the NBN in Western Sydney. It was common for Labor Senator Stephen Conroy, who is regarded as the founder of the NBN project and who held the Communications Minister post for five years from late 2007, to hold site visits to NBN construction zones. On such occasions, it was common for the Minister to invite journalists to attend such visits and launches — both from local media outlets as well as national mainstream media and the dedicated technology press. However, it does not appear as though any media was invited to attend Turnbull’s site visit last week in Blacktown, or if the Minister took questions on the NBN rollout in the area. The result is that Turnbull’s video on the issue has an extremely positive tone and does not address criticism of the Coalition’s re-shaping of the NBN project. Turnbull’s approach to the issue marks the second time in the past several weeks that the Communications Minister has avoided taking questions from the media on the issue of the NBN. In mid-October, the Financial Review and The Australian newspapers revealed that several former Telstra executives with close personal connections to Turnbull have been appointed to assist NBN Co with a Strategic Review of its current and potential future models for deploying the National Broadband Network. The two executives are JB Rousselot and Justin Milne. Shortly after the appointments were revealed, Turnbull attended an event in the Sydney suburb of Paddington to launch a new technology startup incubator space formed by Telstra. However, the Minister did not take questions after speaking at the event. Given the fact that technology journalists from most major media outlets were present at the event, Delimiter requested Turnbull hold a brief doorstop interview following the proceedings to address the reported appointments of Milne and Rousselot to NBN Co, as well as other matters. It is normal behaviour for Ministers to take questions briefly in doorstop interviews after events of this nature attended by the media, and Turnbull has done so regularly in the past. However, the request was declined, with Turnbull’s spokesperson citing time pressures, and Turnbull left very shortly after the formal section of the Telstra event was over. The news comes as Prime Minister Tony Abbott has reportedly imposed a media blackout on Ministers such as Turnbull commenting to the media or granting interviews on issues in their portfolio, unless they get permission from the Office of the Prime Minister. While in Opposition, Turnbull lampooned the then-Labor administration of the Federal Government for creating positive promotional material with respect to the NBN. In July 2012, Stephen Conroy’s broadband department created its own tabloid-style print newspaper, which was to be distributed to Australian residences and businesses in an effort to continue educating local communities about the benefit of the NBN. There’s never any hypocrisy in politics…. So less than 30% think the NBN should be FTTN…that seems pretty consistent to previous surveys. Due to the consistency and numbers involved, I think Malcolm should reconsider his mediocre network plan and stick to one that actually has a future. How did you conclude about 30% want FTTN from that result? That is less than 30%. Less than 30% disagree with the proposition that the NBN should deliver faster speeds even if it costs more. In other words, less than 30% believe that the price is too high, and that the NBN should instead deliver slower speeds for cheaper. The only well-known and/or well-understood alternative that has been put forward to provide slower speeds for cheaper is FTTN. That is how Tinman comes to the conclusion that less than 30% support FTTN. But in fact, Tinman is wrong. Less than 30% believe that either the NBN should deliver slower speeds for cheaper (FTTN) OR deliver slower speeds for cheaper with another technology OR not deliver anything at all. So in fact, much less than 30% support FTTN. You cannot make any conclusions about FTTN, it was not part of the question, and what does ‘even if it costs more’ mean, it is so vague, costs more than what? I agree that to be so…”if”, one has proven ideological motive not to want to recognise the obvious conclusions and/or only has one eye and that one eye is pitifully, perpetually blind to facts…. that is. Put voting intent into the demographic and for the Coalition you get Strongly disagree 21.2% Somewhat Disagree 27.2%, Somewhat Agree 21.1% and Strongly Agree 12.1%. The Coalition won the elections. More people who intended to vote for the Coalition disagree. Therefore, the fact that the majority of people agree is irrelevant. Another amazing deduction from you. Just out of interest, have you ever acknowledged anything negative about the Coalition? I expect some trivial points will be in your answer, if you provide one. Not sure how you came to that conclusion, that wasn’t the question asked. If you wander around the open NBN debatey parts of the interwebs you’ll find that’s not the case at all. Some strongly support FTTH aka the NBN as it is (the question asked), some are in the middle and lean either towards one plan or the other, a few support FTTN. However most opponents of Labor’s NBN would rather no BB investment at all or even crazier mobile. For them FTTN is the “least bad” option because it’s seen as cheaper. It’s tactical support. It’s like people who oppose a price on Carbon. You think those people support Direct Action? No, they don’t support any action. They’d rather nothing be spent on the issue but see Direct Action as something easier to scale back when “the fashion changes”. I’m sorry, but doesn’t the Zig-mester look totally like the school chemistry nerd in this year’s home-room photo? Arms straight down, looking at the teacher and generally displaying a need to be somewhere else! He’s been around politicians so long he’s learnt to be the parrot (the person that stays on the shoulder of the speaker and nods approvingly). It seems like such a trivial thing to focus on, but I agree. The body language here is a tad suboptimal, it was this that struck me the most about this video. Well haha yeah, that would explain why Australia is the way it is in 2013. Gee what a partnership we make! Yeah bring back the big orange button and the interactive dance mat – that was a real class act. Oh my he left comments open on his youtube video… Prepare for a pounding. I’d watch the video but I cant get adsl at my house as im 5.6kms and have to rely on mobile broadband thats $65 for 8 gigs or $8.5 a gig…………. My area was going to get NBN, but it looks to be changing…………. This headline reminds me of the Heisenberg Uncertainty Principle. Must be a slow news Monday. Good thing he’s technology agnostic and no decisions have been made pending the outcome of the review…. Ah, yes. Nicely picked up, SimonB15. So much for more openness and transparency. The very simple way to show you are actually going to do that is to provide an opportunity to answer a few simple questions. What is Turnbull hiding from? It should also be noted that one site does not a rollout make. What’s happening in Blacktown certainly doesn’t represent what is happening elsewhere. I am sure that point would have been raised if Turnbull allowed questions. What is Turnbull hiding from? Damn…. I wish i knew he was there just so I could personally ask him about his “sooner and faster” policy since my whole roll out area in Btown has gone with the wind…. looks like Malcolm is the one being told to wear the red underpants at the moment, to me? cant even comment on issues pertinent to ones OWN folio – i cant think of any time in my life so far where this has been the case in aussie politics, tho my memory is almost undoubtedly faulty. im just pulling blanks…. anyone think of an occasion? whether unique or no its the most monumental clam up, reducing to the smallest target i recall seeing….. my first instinct is that i really do not like it. for all the foibles of the labor party you could at least see largely what was going on, even if what one saw wasnt always pretty viewing. this, by contrast, is the puppet show put on where we only see the performance window, we’ve no idea what else is going on back of house. for a brash big talking outfit prior to the election to this, its jarring.